I have a really, really bad memory. My memory’s okay but it needs jogged by seeing my yarn every once in a while and all the forgotten yarn was hidden behind cupboard doors. My stash is multiplying without my permission. A more rational explanation might think that it is clear that I’m a) not knitting fast enough AND b) I’m using new stash before old stash. And given that it’s February and I still don’t have finished mittens I might have to concede to this. To be fair though, I’ve done a LOT of knitting to get this far. It took three (or four?) starts before I got gauge. Actually, the gauge is supposed to be the same as the hat—and the same as (similar to?) 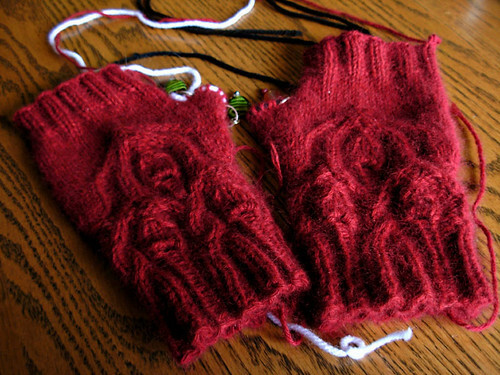 the mitts I knit for my dad and brother—so I thought I knew what needles size I needed. But. There are more stitches in the cuff for these than for my dad’s mitts, so in reality I needed to go down a few needles sizes to make a nice, snug cuff. (Also, the mink-cashmere doesn’t pull in on ribbing as much as Cascade Superwash.) Then, I was through all the cables and almost to the rib top when I realized that the thumb as written didn’t work for me. So I ripped back halfway and added a gusset. Fortunately, my best guess as to how many stitches to add and where worked on the first try. Since I took the picture, I’ve knit the left thumb three times—the number made necessary by working out how fast to decrease the extra stitches. There’s probably an easier way to do that. Sigh. I now need to work out how to finish the flip-top. It shouldn’t require any modifications (I hope! ), so I hope I can fly to the finish this weekend. Of course, it’s not supposed to be cold enough that I’ll actually need these super-warm mittens any time soon! If your stash is multiplying on its own (and it has good taste, of course), is that a problem?